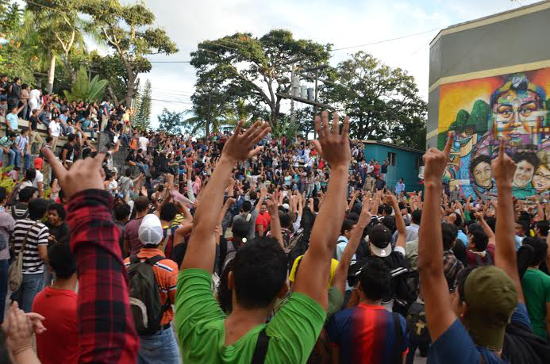 The streets of Tegucigalpa came alive once again with the sounds and colors of resistance, as thousands of Hondurans took to the streets on December 1 to denounce electoral fraud. While the spotlight remains focused on the contested presidential election results, the future of communities involved in grassroots struggles outside of political party lines is also at stake. According to the Honduran electoral tribunal, ruling National Party candidate Juan Orlando Hernández won the presidency with 37 percent of the vote to Libre candidate Xiomara Castro’s 29 percent. However, Castro maintains her declaration of electoral victory and, at an evening press conference on November 29, called on supporters to take peaceful action. “We do not recognize the legitimacy of any government that results from this shameful assault,” said Castro. The Libre party issued a statement denouncing alterations during the scanning and tallying of results, thousands of cases of discrepancies between physical and electronic records, and irregularities regarding scrutineer credentials and the transmission system. Numerous reports by international observers attested to irregularities and intimidation. Libre party leaders declared that they were willing to take their challenge to the courts, but on December 2 the electoral tribunal agreed to proceed with a revision of all tally sheets. Another upstart political force, the Anti-Corruption Party (PAC), officially in fourth place with 13 percent of the vote, filed formal complaints early on. Both Castro and PAC candidate Salvador Nasralla repeatedly called for calm throughout the week following the November 24 general elections. Students didn’t wait for top-down party directives. Canisters of tear gas rained down on National Autonomous University of Honduras (UNAH) students in Tegucigalpa on November 26 after they decided in an assembly to protest electoral fraud. University students in both the capital and in San Pedro Sula continued non-partisan mobilizations denouncing fraud throughout the week. The December 1 mobilization in Tegucigalpa called by Libre and the National Front of Popular Resistance (FNRP) was part protest, part funeral procession. Long-time resistance activist José Antonio Ardón was murdered near his home in the capital on November 30. He was involved in the motorcycle motorcade of the FNRP, formed in the wake of the 2009 coup d’état that ousted Castro’s husband, former president Manuel Zelaya. The casket carrying Ardón’s body accompanied the march to the electoral tribunal and on to his wake. Ardón wasn’t alone. El Carbón co-operative members María Amparo Pineda Duarte and Julio Ramón Araujo Maradiaga were murdered on November 23 on their way home to Cantarranas, an hour outside of the capital. They were affiliated with the CNTC, a national farmworkers organization, as was Gilberto Lara, killed only days later in the department of Santa Bárbara. “Since the coup d’état, we’ve had more than 103 comrades murdered and we don’t want this to remain in impunity,” CNTC General Secretary Franklin Almendares told journalists at a November 28 press conference. More than 20 Libre activists have been murdered in the past year and a half, but many of them also belong to grassroots organizations and initiatives that long predate the party. Repression against communities struggling to defend lands, territories, and resources continues unabated. “Independently of whoever wins, the situation, for example, of Río Blanco is going to get worse,” said Berta Cáceres, General Coordinator of the Civic Council of Popular and Indigenous Organizations of Honduras (COPINH), in an interview just prior to the elections. Two hundred kilometers northwest of the capital, indigenous Lenca communities have maintained a blockade for eight months, protesting the construction of the Agua Zarca hydroelectric dam on the Gualcarque river. The State responded with militarization, threats, and criminalization. Local community member Tomás García was shot and killed by a soldier on July 15, and three COPINH leaders, including Cáceres, are facing charges related to the ongoing protest. Honduran President Porfirio Lobo isn’t the only one on his way out. Honduras’ longstanding two-party system is following suit. Both Libre and PAC made significant inroads into Congress, where all but three of the 128 seats were split between members of the National Party (48), Libre (39), Liberal Party (25), and PAC (13). If they stick to party-line voting, the Liberal Party will end up wielding significant power, able to make or break a majority with either Libre or the National Party. It is too early to know what alliances may unfold once the new administration takes power in late January 2014, but PAC congressman-elect Virgilio Padilla announced that he is trying to promote a short-term understanding between the Liberals, Libre, and PAC in order to form the congressional steering committee. “We think an opposition force should control the Congress to avoid abuse of power by the ruling party, and so that the ruling party stops interfering in other branches of government,” Padilla told Honduran newspaper La Prensa. Not all power lies with elected politicians, though, said Cáceres, who does not believe the landowners and economic and business elite will not give up their control of the country so easily. The same military that participated in the 2009 coup is now being used to intimidate politically active women, according to Gladys Lanza, coordinator of the Visitación Padilla Women’s Movement for Peace. “We’re a grassroots organization working with neighborhood women. They were letting us know that soldiers – sometimes masked – were coming to their homes to intimidate them, but also to engage in profiling within the communities,” Lanza told Upside Down World in an interview in the office of the Committee of Relatives of the Detained-Disappeared in Honduras (COFADEH), where she had denounced and recorded the harassment. In the weeks leading up to the elections, soldiers were visiting women’s homes in Tegucigalpa, asking questions, finding out how many people lived where, and taking pictures, she added. They targeted women who have been politically active in their communities, particularly in the last four years since the coup. “Hopefully it’s just intimidation, because we don’t know what their intentions are. We understand that it’s for profiling, but in any case we wanted to denounce it in advance in COFADEH in order to protect the lives of the women,” said Lanza. It’s not just the behavior of the armed forces that Lanza finds offensive, but their very existence. “They don’t defend sovereignty, which is their constitutional mandate, and therefore they have no reason to exist,” she said. The elimination of the military was one of the main demands made in the streets by the resistance movement in the wake of the 2009 coup. The country is under a continuing foreign occupation as well, with the presence of US troops and military bases in Honduras. “It’s going to continue happening because the country has military agreements with the government of the United States that reinforce this presence here in our territory. We’ve got a long road ahead of us to kick [US] troops out of our country,” said Lanza. Many organizations and struggles in Honduras have long roads ahead of them, and they don’t all fit into campaign slogans and four-year plans. The incursion of the resistance movement into electoral politics was not a unanimous decision. However, by and large, social movement organizations are more or less supportive of Libre, and many took to the streets to protest electoral fraud. But they also created their own independent space, the Platform of Social and Popular Movements of Honduras, to coordinate mutual support and for systemic change. Barring any major changes to the official results of the elections, strategic alliances will become necessary to effect change from within during the 2014-2018 administration. Other forces engaged in struggles outside the electoral system will continue to work together on the long roads, winding dirt paths, and military landing strips ahead. Once the dust has settled, the spotlight so tightly focused on the contested presidential elections will be removed and a broader picture will gradually become more clear. Sandra Cuffe is a freelance journalist currently based in Honduras.